• For quantitative determination of isocitrate and evaluation of drug effects on its metabolism. • Fast and sensitive. Linear detection range (20 μL sample): 0.6 to 500 μM for 10 min reaction. • ISOCITRATE (ISOCITRIC ACID) is a substrate in the citric acid (TCA) cycle. Isocitrate is formed by the isomerization of citrate catalyzed by the enzyme aconitase. Isocitrate is oxidized by isocitrate dehydrogenase producing α-ketoglutarate and generating NADPH. Isocitrate is commonly found in many fruits and vegetables and their processed products. Industrially, isocitrate is used as a marker to identify the quality and purity of fruit juices. BioAssay Systems? 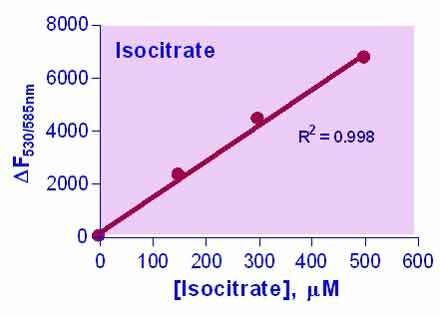 isocitrate assay measures the NADPH generated from the oxidation of isocitrate. The NADPH reduces a probe into a highly fluorescent product. The fluorescence intensity of this product, measured at λex/em = 530/585 nm, is proportional to the isocitrate concentration in the sample.